For the second time in less than two weeks, a bike rider has been killed in a collision with a Metro bus. According to KCBS-2, the victim, who has not been publicly identified, was hit by the bus around 3:15 pm Monday near Crenshaw Boulevard and Brynhurst Avenue. He or she became pinned underneath, and was pronounced dead at the scene. A street view shows two lanes in each direction on Crenshaw, with the street narrowed due to construction on the Crenshaw Line on the center median. This comes just ten days after 13-year old Ciara Smith was killed when she was hit by a Metro bus in Redondo Beach. 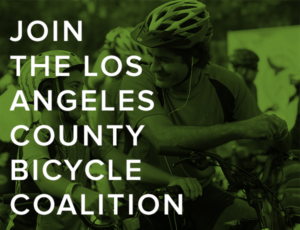 This is the 21st bicycling fatality in Southern California this year, and the 12th in Los Angeles County; it’s also the third in the City of Los Angeles. Update: David Wolfberg provides more information about this tragedy, along with photos from the site. 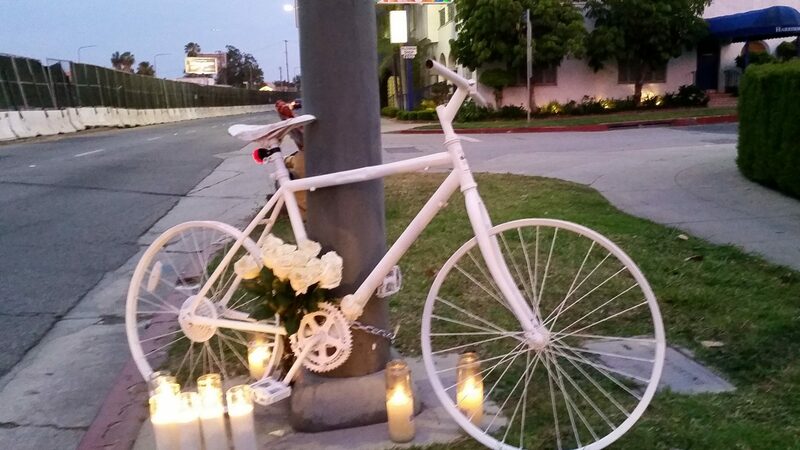 The ghost bike was placed last night. 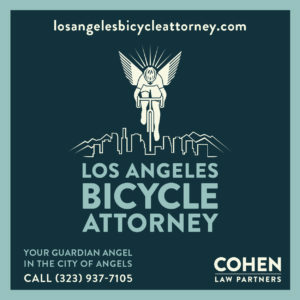 We learned from after-the-crash witnesses that the bike and victim had been dragged for half a block on southbound Crenshaw before stopping just north of Brynhurst – literally between a billboard for a personal injury attorney service to the north on the east side of Crenshaw (“Don’t wait, Call 8!” you can see on the street view) and the Harrison-Ross Mortuary on the west/south. Apparently there’s also a pedestrian & bike safety billboard on the other side of of the personal injury one – I’ll check that tonight. The Google Map view (see street view link above) from January still holds except the cones are gone – so, two lanes of not so great pavement between curb and k-rails. There’s even a worn out sharrow in front of Highly Favored Hair Studio. Last night, instead of slowing down for a construction zone, cars were speeding and speeding up as they passed us, and we nearly witnessed another crash as a car stopped just north of the ghost bike to pick up a passenger from the sidewalk. I worry not just for cyclists, but for everyone here including construction workers who park (in a heavily guarded lot) a block down on the NW corner of Crenshaw and 48th then must cross into the construction area. We’re told the victim was male. A reply on NextDoor indicates the victim was a minor. We had guessed, given the timing, that it was a kid biking home from school. I don’t want to speculate too much, but it did not look like an intersection crash where the bike flew in from out of nowhere. 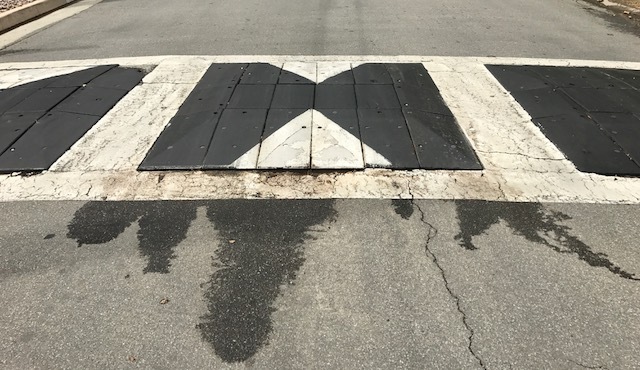 I could picture a rider trying to hug the curb and coming across the rough patch adjacent to the sharrow (check street view at 4427 Crenshaw) and faltering in front of the bus. Update: According to a comment by the victim’s sister, his name is Luis Alvarez, a 21-year old resident of Cicero, Illinois. The family has started a GoFundMe account to bring him back home and pay funeral expenses. 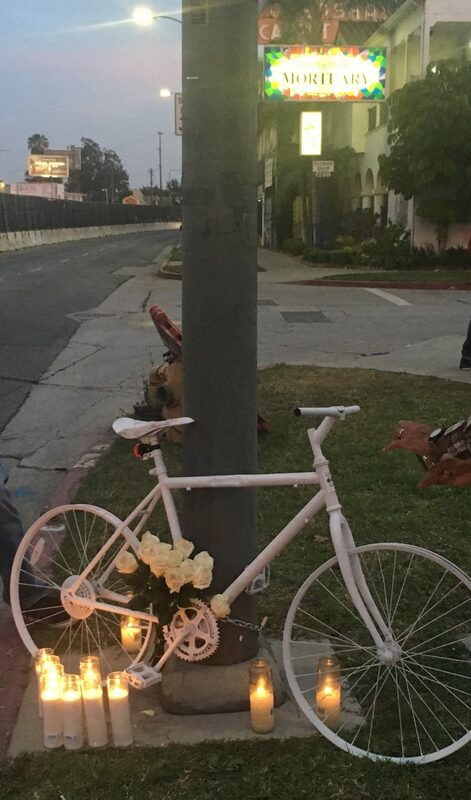 According to the LAPD’s South Traffic bike liaison, Alvarez apparently passed the bus on the right, then was hit by the bus when he attempted to move back to the right to make a right turn onto Brynhurst. There’s no word yet on whether the bus was stopped or moving prior to the crash; however, a street view does not show a bus stop on that corner. 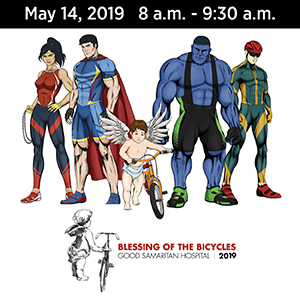 My deepest sympathy and prayers for Luis Alvarez and all his loved ones. 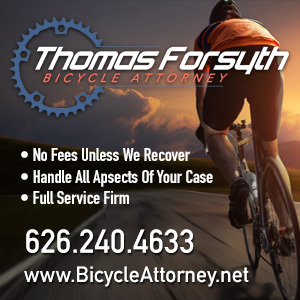 Sad news from Temecula, where a man on a bicycle died following a Wednesday night collision. According to the Valley News, the victim was struck by a truck driver who was turning right from eastbound Temecula Parkway to Pechanga Parkway around 8:52 pm last night. Riverside County sheriff’s deputies responding to the scene found the man, who has not been publicly identified, lying in the roadway suffering from major injuries. He was taken to a local hospital, where he died today. There was no indication that alcohol was a factor. Based on the limited description, it would appear the rider was the victim of a right hook. However, there’s no word on where the victim was riding at the time of the crash. A satellite view shows a major intersection with seven through lanes and two right turn lanes on Temecula, which suggests that he may have been riding on the sidewalk and rode off into the crosswalk. However, that is just a guess at this time. Anyone with information is urged to call Officer Carpenter at the Temecula Police Department at 951/696-3000. 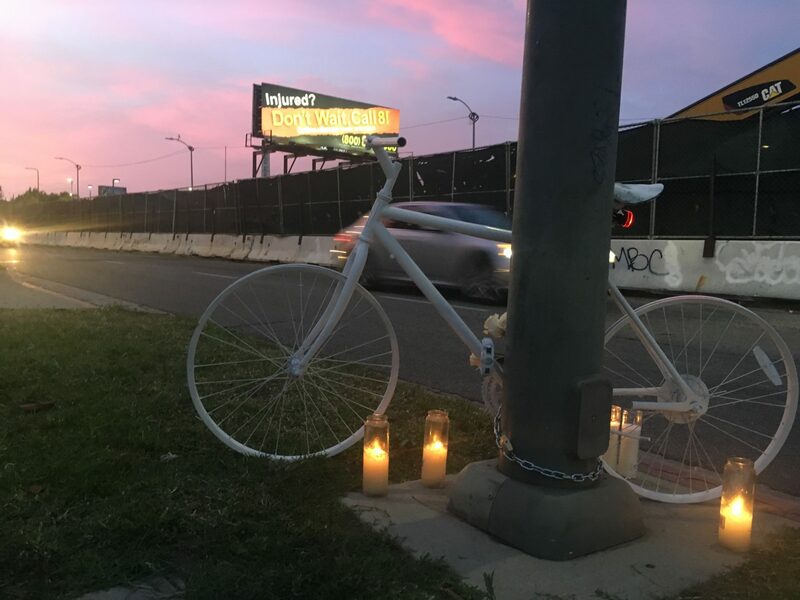 This is the 15th bicycling fatality in Southern California this year, and the second in Riverside County. Update: The victim has been identified as 56-year old John Napolitano. My deepest sympathy and prayers for John Napolitano and his loved ones.